Welcome to 'Ohana Arts & Hula Studio! Hampton Roads' (and the world's!) first arts and crafts studio and sewing lounge with an island touch. 'Ohana Arts & Hula Studio offers classes in art, crafts, sewing, Hawaiian quilting, crafts, etiquette, foreign languages for kids, and DIY workshops. We also offer Polynesian dance lessons, demonstrations, and performances via our Kinderhula  and Polynesian Dance Studio divisions. Mahalo (thank you) for your interest. Why choose 'Ohana Arts & Hula Studio LLC? * 'Ohana (family) comes first - I offer many family-friendly classes. Families are welcome and I offer a family discount on all of my studio classes. * Our mission is to honor and perpetuate the traditions of our past. It is my goal to spread the aloha spirit by teaching and sharing these traditions with others. * Quality instruction: Learn using professional programs with successful, progressive curriculums. * The director/ head instructor is patient, caring, and safety-minded. I am a mom to 5 children. I also have had background searches via Girl Scouts, Newport News parks and rec, York County parks and rec., and FINRA I also maintain current first aid and cpr certification. Safety is number one with me. * We offer unique services: hula, sewing, and more all under one roof! * I was born and raised in the islands so you will definitely get a genuine cultural experience. Our dances are authentic and traditional with colorful and culturally-accurate costuming and choreography. Many of our dancers are real islandgirls, too! * We go the extra mile to serve with a Polynesian smile and always with the Spirit of Aloha. Come experience the 'Ohana Arts & Hula Studio difference! * You will receive personalized attention. You will have direct contact with the director and owner and all classes are small and personalized. * We have affordable tuition and fees for our classes. We also offer reasonable prices for our Polynesian dance group performances and parties. * Our studio is secure and spacious. Our new suite is about 1100 square feet. * Opportunities are available for showcasing your talents. Community performances and an annual recital are available to my dance students and a fashion show is available for my sewing students. 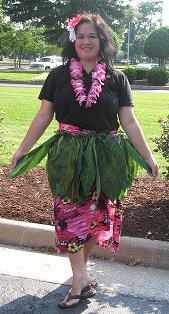 We also offer an annual Hula and Fashion Show depending on our schedule. Please call me at 757.369.0996 or email us at info@ohanaartsstudio.com for more information, to register for a class, or to book an event. Mahalo! Thanks! "Hampton Roads' Ambassador of Aloha"
Offering Classes, Special Events, and more! A portion of all proceeds benefit the Hula Preservation Society, Aha Punana Leo (which supports Hawaiian language immersion schools and language revitalization), and other various charitable organizations in Hawai'i and Virginia. Mahalo ia 'oe no ke kipa 'anamai. 'Ohana Arts & Hula Studio, LLC is located in the Mariner Building which is between Harris Teeter and CNU Village.